KENNEDY SPACE CENTER, Fla. — Children might not want to hear this, but, if they want to be the first astronaut on Mars, they’ll need to eat their vegetables. To account for that painful truth, NASA has several space farming projects to ensure people living and working in space get fresh green stuff as part of their diet. One project the agency has in work is the Advanced Plant Habitat (APH), an experiment scheduled to head to the International Space Station (ISS) later this year. This 18 × 18 × 18-inch (45 × 45 × 45-centimeter) enclosure contains a seed bed filled with thick sand-quality clay chips for soil, fertilizer, and pumped-in water. It is covered by a plastic top to keep the surface from floating around. The enclosure also includes two small robotic arms, which take leaf temperatures and measure the interior humidity. Thin-stemmed flowering plants called Arabidopsis (“the white mice of the plant world”) will be tested for different levels of humidity, water, and light, which consists of red, white, and blue light-emitting diodes (LEDs), to determine which combination of factors most effectively support plant growth. After the astronauts plug APH into an existing EXpedite the PRocessing of Experiments to Space Station (EXPRESS) rack aboard, they can monitor the experiment using an existing computer called FARMER or let people on the ground run it. The system runs on approximately three liters of water and, being a mostly closed-loop system, it can run for as many as six weeks without needing to be refilled. APH is scheduled to be launched in two parts. The first will launch on Orbital ATK’s OA-7 Cygnus launch and the other aboard SpaceX’s CRS-11 or CRS-12 Dragon spacecraft. One NASA plant experiment already aboard the ISS is called “Veggie”. Filling approximately a 12 × 12-inch (30 cm × 30 cm) area, Veggie is a soft plastic enclosure that can accordion from six to 12 inches high. The base of the enclosure contains half a dozen “plant pillows” containing ground clay chips and fertilizer, which substitute for the dirt they would use on Earth. The enclosure includes an interior fan to draw in space station air and keep it moving around the plants. Without constant air movement, plants in zero gravity tend to build up bubbles of oxygen around themselves. Veggie project scientist Gioia Massa explained that unlike the APH, the Veggie experiment is actually growing plants that astronauts can eat, like Chinese cabbage, bell peppers, and jalapeno peppers. Astronauts are allowed to keep and eat half of the crop developed by Veggie, while the other half is packaged up and sent back to Earth for analysis. Plants could be useful for more than just providing food for space travelers – they could also supplement spacecraft life-support systems by providing oxygen. Raymond Wheeler, Kennedy Space Center’s advanced life support lead, is looking into growing plants using what’s called controlled environment agriculture. Plants will be much easier to grow on a planetary body like the Moon or Mars because gravity allows water to flow more naturally than in zero gravity. With planet-based agriculture in mind, Wheeler is studying Earth-based techniques such as hydroponics and LED-lighted greenhouses to maximize plant growth. NASA’s advanced greenhouses can produce useful outcomes on Earth as well. While it’s hard to beat Idaho for growing consumable potatoes in the ground, Wheeler explained that NASA’s nutrient-film technique is ideal for growing seed potatoes, which provide the seed stock for the potatoes grown on Earth. By planting seed potatoes in shallow, tilted trays with a thin layer of nutrient-laden water, they can grow in a clean, disease-free environment, which is better for producing high-quality seeds. 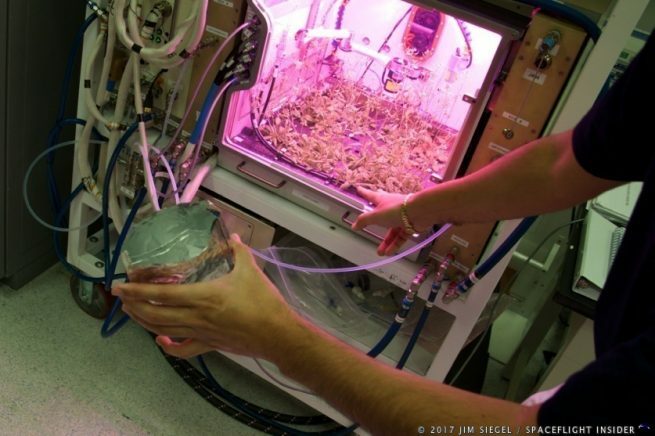 Ralph Fritsche, Kennedy Space Center’s project manager for food production, is looking into multiple creative ways to keep plants fed and watered in zero gravity. Another challenge with growing plants in zero-g is overcoming surface tension, as water tends to form in globules rather than flow in a way plants can access easily. One approach to embedding seeds in a 3-D-printed, triangle-latticed box that draws water into crevices where roots can get at it. Some other strong contenders for Mars veggies are microgreens, which are commonly found in salads at upscale restaurants. They don’t take up a lot of room, are more flavorful, and can grow in a couple of weeks. Fritsche also mentioned a project being conducted by the Buzz Aldrin Institute to investigate plants that grow in the Atacama Desert in Chile. 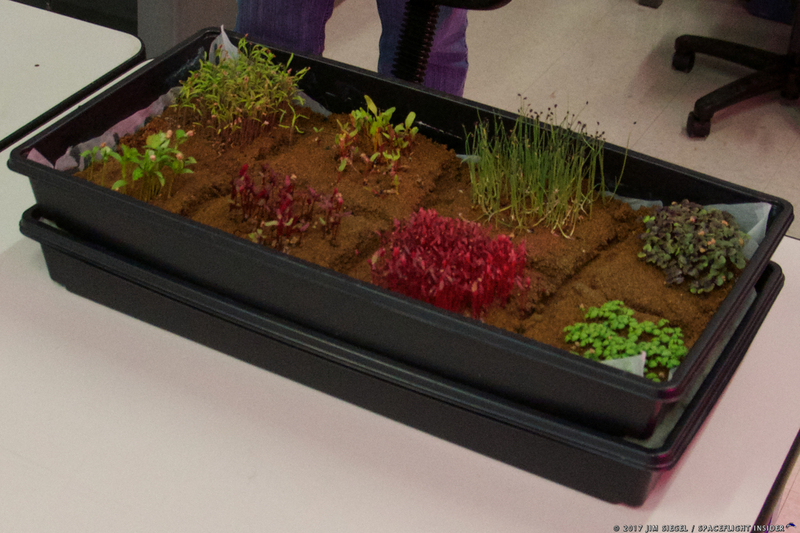 It is hoped that edible plants could be combined with Atacama plants to adapt to conditions on Mars. Something NASA is still working on is determining how much space and mass will be dedicated to providing fresh vegetables on the long haul to Mars. 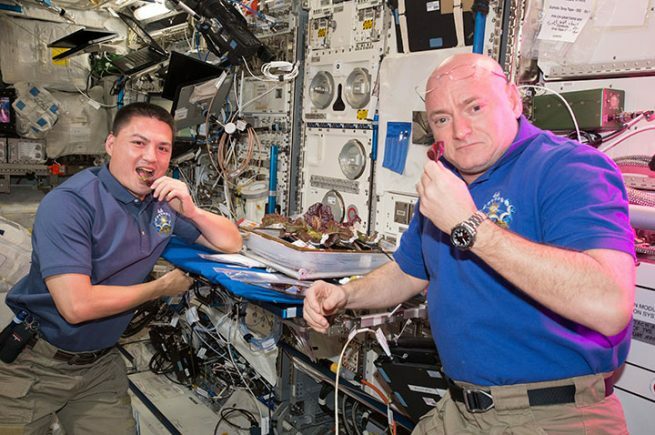 Most of the astronauts’ food will be prepackaged in some form, yet fresh fruits and vegetables will still be vital for their dietary health. In short, NASA still needs to determine how much hardware to grow and care for plants is needed compared to just shipping prepackaged foods. Much of this space farming technology is still a work in progress, and the ISS is the testing ground for a lot of systems. When crews start living and working at more distant destinations, they will need to take a bit of Earth with them, to help them breathe and, yes, to make sure they eat their vegetables. The LED panels could be upright, the trays could be fashioned into a wheel and then rotated at such a rate that the water is forced into the material being used for rooting. Since the light is on the side, it would not interfere. Add some sort of light scattering device at the center of the wheel to push light toward plants. Maybe even put rooting medium into a pouch of some kind, or covered by a film. Just a thought.